Happy 4th July America! 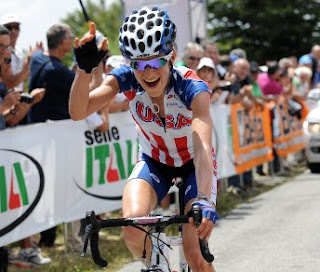 On American Independence Day Mara Abbott dominated the queen stage (14 km climb of 8.4% average) of the 24th Giro Rosa by taking over the pink jersey. The 27 year old from Boulder, Colorado, and 2010 Giro d'Italia Internazionale Femminile winner, had no rivals in the Varazze-Monte Beigua stage. She arrived at the finish line 1'44" ahead of the surprising young Francesca Cauz (Top Girls Fassa Bortolo) and 1'49" ahead of the veteran Fabiana Luperini (Faren Kuota) and 1'51" ahead of Tatiana Guderzo (MCipollini Ale Galassia), who confirmed herself the best Italian in the general classification. The shortest and toughest stage of this edition has changed the general classification, with Marianne Vos losing 5'15" from today's winner. "I knew it would be a difficult day because I'm not at the top of my condition and for that reasonI've tried to gain time bonuses over the last few at every intermediate sprint," said Vos. "I expected to perform better but as usual I did the best I can. I'm disappointed to lose the maglia rosa because I really love this race, but it's not over until it's over." Cauz, the best young rider, was very happy: "I knew I was in shape, I'm happy to show everybody. I want to thank my teammates, my director and all the sponsors. I hope to arrive in Cremona with the white jersey, for them also." Guderzo, now 2nd in the general classification: "I dream of wearing the pink jersey. The last day's time trial suits me but today was a really big effort and tomorrow won't be an easy ride either. I'm living the Giro day by day, but still aiming towards the big goal."